It’s time to be terrified by John Krasinski’s critically-acclaimed film, A Quiet Place. To celebrate the Digital release out now, and the 4K Ultra HD, Blu-ray and DVD release coming up on 13th August we are giving you the chance to win a copy of the haunting thriller on DVD! 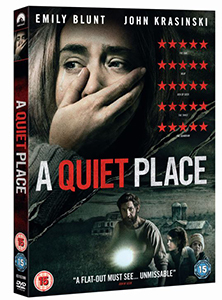 A Quiet Place – See it first on Digital out now and on 4K Ultra HD, Blu-ray and DVD 13th August. A Quiet Place © 2018 Paramount Pictures. All Rights Reserved.